Some things are so obvious that they come as a complete surprise. Plants grow and it shouldn't need saying that they become larger as a result and things change. I have been clearing space to the west of the house for a year or more. Saplings that were planted to keep off the worst of the wind had grown into trees and the house was disappearing into their shadow. The time had come to remove them and let the light back in. As the sun set during the autumn, flashes of burning orange light appeared through the trees for the first time in a decade. 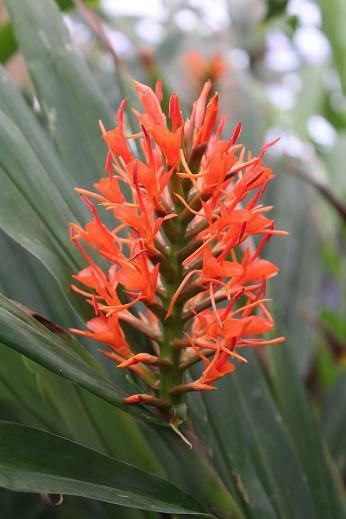 In the Hedychium house the summer growth has filled the space and closed the path so that I have to fight to get through it. The flowers have been magnificent this year but the season is coming to an end. 'Palani' is producing flashes of burning orange through the dense overgrowth but the atmosphere in there is cold and humid so there is hardly any scent. It is also possible that there isn't any 'Palani', as my plant is much darker than illustrations from the USA. I like the deep colour of this one but I have a second plant that came from a nursery in Hawaii originally. It may be the real thing but it doesn't flower. Like the glimpses of the setting sun, these flowers are almost over. Last weekend I set fire to the latest heap of branches I had trimmed. No burning orange flames. It smouldered lazily for hours. A plume of grey smoke rose into the grey sky like a giant finger switching off summer. On monday morning I woke to find a ground frost had visited the garden. The autumn leaves have all fallen and it is time to collect up the last of the 'tenders' and find places for them in the greenhouse. I left the house in trepidation. Looking into the threat of winter it seems like a dark place but walking up the hill the garden was filled with low sunlight. It seemed cleaner and clearer than it has for months, the congested foliage has gone and taken with it the urge to look back constantly at how things were. In short, the place looked optimistic. The first thing I noticed were the Mahonia. They have been flowering for a few weeks now, looking out of place among autumn colours and Cyclamen. Suddenly the sharp yellow flower heads have come into their own. 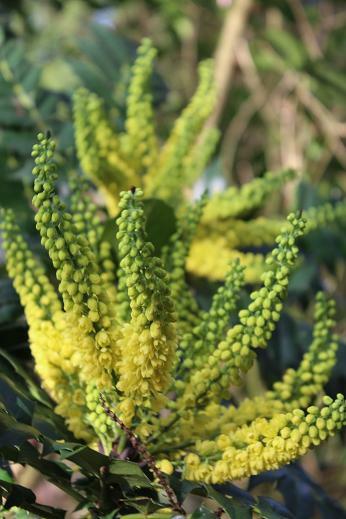 Mahonia x media is splendid in all its named, un-named and wrongly named variety but this is one of the parents. It has made a giant upright shrub, all bare stems and prickly leaves. I regularly threaten to cut it down to the ground and force it to start again. Mahonia regrow with astonishing vigour if they are butchered but there is a drawback. If they have been butchered they manage to look as though they have been butchered for decades after. They seem to take delight in exposing bare stems that terminate abruptly and in forming ugly mounds. This specimen is not a graceful thing, it is a sheaf of bare sticks adorned with rosettes of saw blades, but it could be a lot worse. I have the sense to avoid being the vehicle that takes it there. I have always seen the various Lachenalia as signs of the spring. Even as a teenager I grew a pot of L. aloides on my windowsill. They would flower in January when it was still too cold to mess about in the garden, a clear sign that the new year had started. The genus has been in a state of some confusion for several decades. 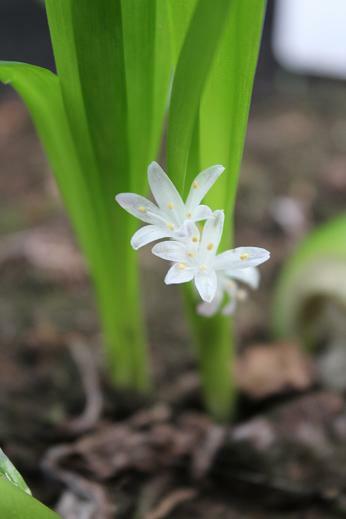 Many new species have been described and a great many hybrids have been raised so that 'The Genus Lachenalia' was a timely publication by Graham Duncan in 2012. It described and illustrated the many species and brought sense and order to their taxonomy. It has also forced me to look at the rather flimsy evidence for dividing the autumn flowering bulbs from those that bloom in spring. In my mind they are different but my mind contains a number of ideas that aren't supported by adequate evidence. For a few years I have been growing some lovely Polyxena species that I value for producing flowers at the end of autumn to liven up the greenhouse. Suddenly they have all been merged into Lachenalia. I am satisfied but not yet comfortable. They aren't quite like the Lachenalia I am used to. On the plus side, the Lachenalia season now starts a lot earlier than it once did. There is a great sense of relief in the garden. It has drifted in like the low winter sunshine making the colours brighter and the air cleaner. It is the sense that last year has been swept away and there is something new coming. Narcissus 'Rijnveld's Early Sensation' is the wonder of the moment. It usually starts to flower in December and brings a sense of the coming spring to the last days of the year. It is a very satisfying plant. The sea-green shoots are wonderful as they appear through the grass. I go looking for them as November arrives. The only thing I can compare it to is standing on the cliffs on a sunny day, looking out to sea and hoping for dolphins. The sparkling sea breaking into low curves that scatter the light and deceive the eye, but on a lucky day the low curves and shadows resolve into curved grey shapes that arc gracefully above the surface. Daffoldils like dolphins. In the meadow I look for the greyish shoots pushing through the grass, frightened to go too close for fear of standing on them. For weeks there is nothing until suddenly one day, there they are. First a single shoot and then as they eye gets used to them, a host of promise appears, scattered but moving with a single purpose. Shoots that elongate with enthusiasm, the buds racing ahead then nodding and bursting almost overnight. 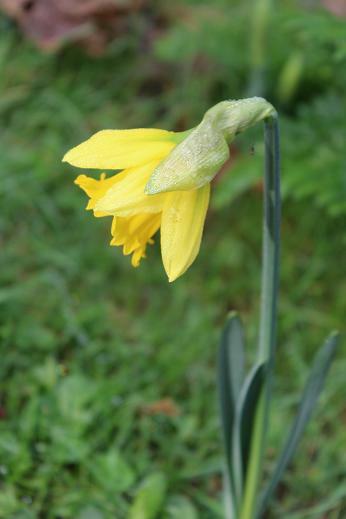 It's just a daffodil, but every year I like it more.